From an elementary school transformed into a vibrant mini-society, to students from different grades and cultural perspectives tackling complex problems facing their communities, these programs have won innovation awards because they empower young learners to understand how they can play a role in solving real-world challenges now, and in the future. 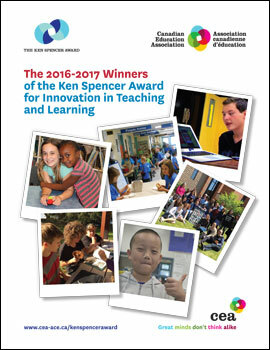 The 2016-2017 CEA Ken Spencer Awards recognize the benefits of team-teaching, multi-grade classrooms, and students connecting with local businesses, organizations and community institutions as supportive learning environments that break down cultural barriers. These programs encourage students’ self-discovery that there’s more to life – and to their futures – than getting good grades. Ken Spencer Award recognition ceremonies are being planned in the school communities of the seven winners. This is the eighth year of this award, and the CEA would like to thank the 102 school and school district staff for their time and effort in the preparation of this year’s award application packages. Founded in 1891, the Canadian Education Association (CEA) is a network of passionate educators advancing ideas for greater student and teacher engagement in public education. CEA does this by conducting research and spreading useful ideas through its Education Canada Magazine, professional learning events, website and social media channels; supporting education systems to be more adaptive to the rapidly changing needs of all learners to reverse the trends of students ‘tuning out’ of their learning opportunities.